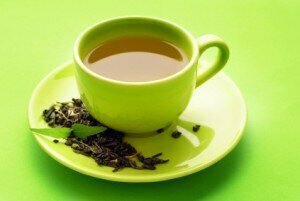 Antioxidants found in green tea may help repair DNA damage caused by sun exposure, according to a recent study in mice. Exposure to ultraviolet (UV) radiation can damage DNA and, in turn, trigger suppression of the immune system—a risk factor for developing skin cancer. The study, funded in part by NCCAM and published in the journal Cancer Prevention Research, examined the effects of polyphenols from the leaves of the green tea plant, which are thought to fight free radicals (highly unstable molecules that can damage cells) and have anticarcinogenic activity. Researchers from the University of Alabama at Birmingham; Birmingham Veterans Affairs Medical Center; and the National Institute of Public Health and the Environment, the Netherlands fed mice drinking water that contained green tea polyphenols at least 1 week before exposing them to UV radiation. As a control, a group of mice were fed drinking water without green tea polyphenols. The shaved backs of the mice were exposed to UV radiation for 4 consecutive days. Compared with the control group, the mice treated with green tea polyphenols had reduced immunosuppression from the UV radiation. This same group of mice also showed more rapid repair of DNA damaged by UV radiation. Further, the study showed that green tea polyphenols increased the levels of some nucleotide excision repair genes, which allow for DNA repair. To determine whether green tea polyphenols provide long-term protection from UV radiation, the mice were rested for 4 weeks after the initial experiment. During this time, they did not receive green tea polyphenols. After again being exposed to UV radiation, the mice that were fed green tea polyphenols earlier showed significantly reduced immunosuppression compared with the mice that did not receive green tea polyphenols at any stage. These findings suggest that green tea polyphenols may block immunosuppression from UV exposure in mice for a longer period of time, even after they stopped consuming the polyphenols. The researchers noted that this study is the first to show that preventing skin cancer with green tea polyphenols in water may be due to the blocking of UV-induced immunosuppression in mice. More studies are needed to determine if green tea has any potential chemopreventive effect on skin cancer in people.